Yes, I did weld this week--my Gypsy was being a little nicer :) I welded the Kitty to the card base and then welded the bat and pumpkin to the base. 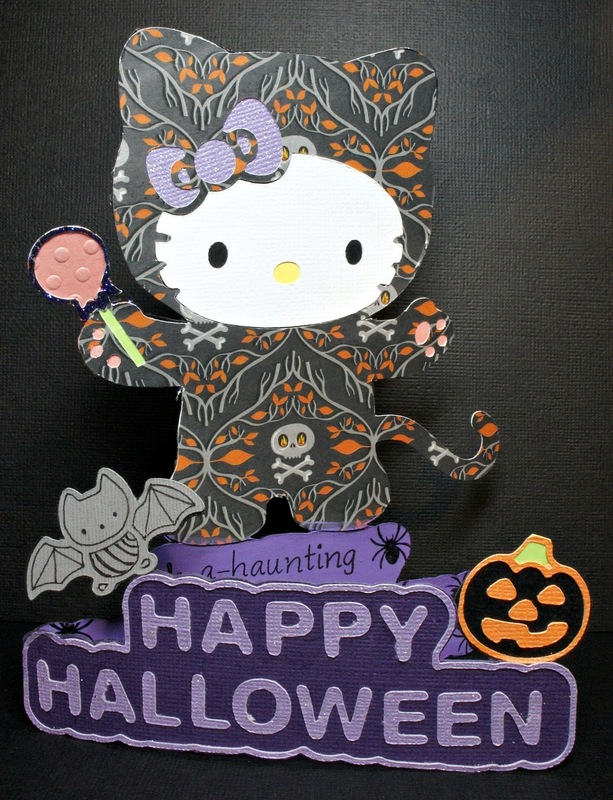 These are all cuts from the Hello Kitty Greetings cartridge. I couldn't decide what to dress Kitty in so I stuck my hand in my bin of Halloween papers and decided whatever one I picked first was what she was wearing. I didn't even try to get the skull in the middle--it just happened and I was happy! On the inside I used the My Pink Stamper's Spook-a-licious stamp set. I LOVE this set!! You can find out where you can get one HERE. Hope you enjoy my Kitty. I'm so glad I took the few minutes to make her. And...thank you to Theresa for picking this cut. Now please go back to BBTB2 and see what all my other teammates made with this cut and then play along with us and upload your creation. That is an adorable card, I love her costume!! Your Kitty is so cute Maria, that paper you used for her costume looks great! 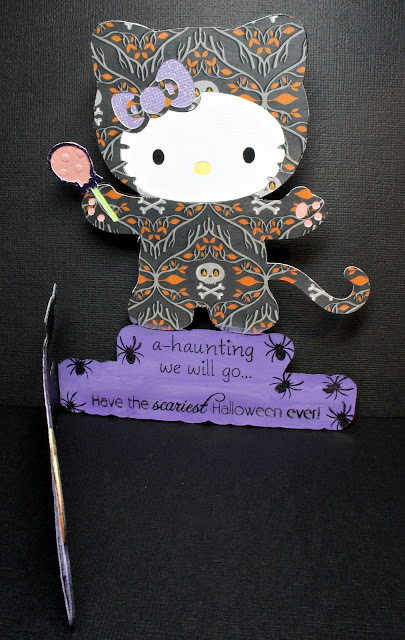 Love your Kitty creation!! And great minds think alike - ehhh? Printed costume??!! Oh yeah! I do love your card - and the kitty on the words is great!! How cute Kitty is....and she is presented so wonderfully. So super cute! Love her pattern paper outfit! Oh my gosh....this is too too cute! Oh Maria I'm so glad you enjoyed the challenge this week! (To be honest I always get a little nervous when it's my turn to pick, lol!) I love the paper you used for her "costume", I don't have much Halloween papers so I love seeing all the papers everyone uses and now I WANT some cute Halloween papers, (yes I'm a little late, lol!) I've loved Hello Kitty for so long. My daughter loved her when she was little, she's 27 now, and now the Grand daughters love her too so I still get to have fun with her! (like I said she's my secret obsession, lol) And Wow, it's been a year, seems like yesturday, time flies when your having FUN!